This article appeared in the October 2011 issue of Wood News. To see the rest of the issue, CLICK HERE. My name is Andrew Sawyer. Since I picked up the hobby of woodworking about 7 years ago, I have begun (as many of us have) filling my house with furniture. The wood slicer is the finest blade I have ever put on my bandsaw, but none of that matters if the machine it is on is dirty and out of whack! Here’s a step-by-step tutorial on cleaning, tuning up and maintaining your bandsaw, so your Wood Slicer will be able to do its best work. 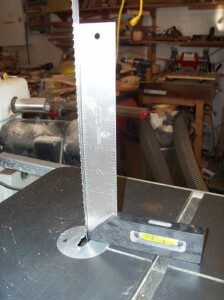 CLICK HERE to learn how to make your Wood Slicer blade do its best work for you! The New issue of Wood News is Now Available! New Product Tours for October: Rikon Bandsaw Comparison, Sharpening Card Scrapers and the ALL NEW R9plus Leigh Joinery System! The Down to Earth Woodworker: Evolution of a Workshop Conversion, all on video!